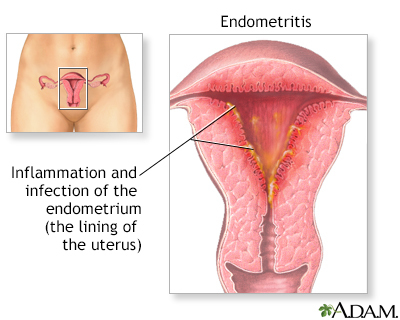 Endometritis is the inflammation and/or irritation of the endometrium. It is usually caused by an infection. Reviewed By: Peter J. Chen, MD, FACOG, Associate Professor of OBGYN at Cooper Medical School at Rowan University, Camden, NJ. Review provided by VeriMed Healthcare Network. Also reviewed by David Zieve, MD, MHA, Medical Director, Brenda Conaway, Editorial Director, and the A.D.A.M. Editorial team.